Fourbody reserves the right at any stage to contact a User to confirm both the identity of the buyer and also the currency and security of the passwords used. Users agree that they will not disclose their Username or password to any third party and agree to indemnify Fourbody against any loss or damage flowing from the unauthorized use of your password or log-in information. A large proportion of the information contained in this site is supplied by third parties. Fourbody does not guarantee the accuracy of the information contained on this site and expressly excludes any liability to any user of the site in relation to incorrect information displayed on it. FourBody reserves the right, at any time, to cancel an order and issue a full refund to the customer. From time to time information that would normally be available through the site may not be able to be accessed online because of technical or other problems. 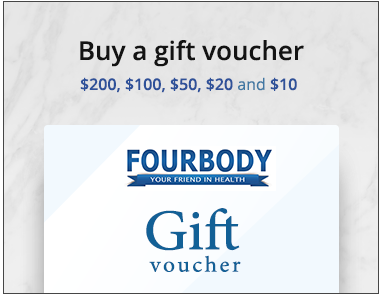 Fourbody expressly excludes liability to any user of this site in respect of the unavailability of content regardless of whether or not this unavailability is caused by the negligence of Fourbody. In the event that a customer has a change of mind and wants to return the parcel to us and receive a refund, the customer will pay for the delivery costs to get the parcel returned. If free shipping was received in the original order and the value of the products returned results in the original order being less than $190 of purchased products then the shipping costs incurred on the original order will be charged too. A processing fee is charged for any returned orders/refunds/cancellations where the reason is due to change of mind. This processing fee is calculated as being 20% of the final order total (this includes shipping and product costs). FourBody advises you to seek professional medical, nutritional and dietary advice before you consume a product from this website. 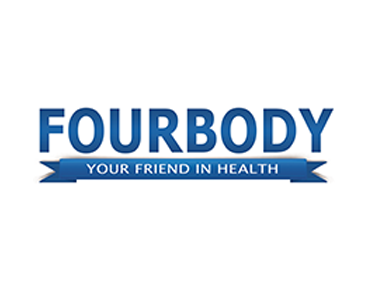 When purchasing practitioner-only products at FourBody, it is the customer's responsibility to only purchase the products prescribed to them by their practitioners and to take them for the length of time advised by their practitioners and at the dosages prescribed. Practitioner-only products are taken at your own risk. FourBody will not be responsible if a customer provides us with invalid/dishonest information about the practitioner. If the customer has purchased insurance with their order then the full amount of damage will be refunded once the matter has been investigated by Australia Post. If the customer not purchased insurance, all claims for damaged or lost items will need to be made directly with Australia Post. FourBody will not be liable for products that are damaged/lost during transit if the customer has not purchased insurance. Australia Post Express Satchels do not require a signature upon delivery. If Australia Post deems the parcel as having been correctly delivered, FourBody in this case also deems the parcel as delivered correctly and is not obliged to refund the customer. In the event where an order has free delivery and the customer agrees to part of the order being dispatched and the rest of the order being refunded, if the dispatched order totals less than $190 then the customer must pay a flat rate shipping fee of $9. This amount will be deducted from the amount needed to be refunded to the customer. If the dispatched order is still over $190 or if the customer adds more products to the order so that the dispatched order is over $190 then free shipping will be provided for.